07/2010 Update: Three years ago the Jersey City Historic Preservation Commission voted unanimously to landmark the church, and the Jersey City Planning Board unanimously upheld the HPC’s ruling, but it has stalled before City Council. The Jersey City Episcopal Community Development Corporation (JCECDC), the development wing of the Episcopal diocese, wants to tear the church down and build affordable housing. The JCECDC has been engaging in constructive demolition ever since, and the City Council whether it realizes it or not has been helping them by refusing to take action. 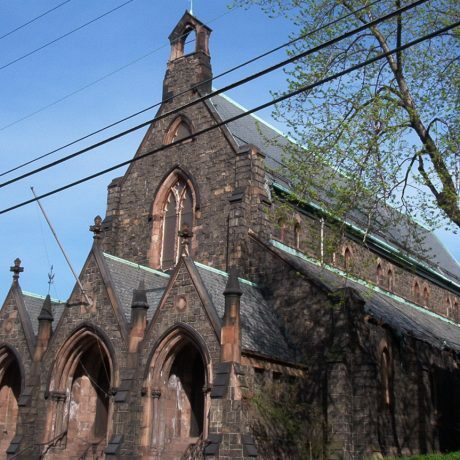 Built in 1870 of brownstone and granite, Victorian Gothic St. John’s once housed the largest Episcopal Congregation in New Jersey. It features a triple arched vestibule and an exquisitely decorated sanctuary with hand cut wooden pews and a Carrera marble altar and pulpit. Badly damaged by fire in 1914, the building was lovingly restored by its congregation, which included many of the bankers, businessmen, and lawyers who made up Hudson County’s oligarchy. The fortunes of St. John’s declined with those of its Bergen Hill neighborhood. As businessmen and professionals moved to the suburbs with their families they were replaced by working people who were mostly African American. In the late 1960s St. John’s became a center of community activism under the leadership of Reverend Robert Castle whose empathy for the poor revived the congregation. But the building has been vacant since 1994 when Reverend Castle was reassigned. While it has deteriorated substantially it is not yet lost, though the building must be stabilized soon. The water-damaged basement currently houses a Baptist congregation, and many important decorative elements survive in the nave, which is currently closed to the public for reasons of safety. PNJ urges the Episcopal Diocese of Newark to explore all avenues for the restoration of this elegant house of worship. It should be possible for St. John’s Episcopal Church once again to become the center of its neighborhood as it already has been twice. 10/07 The JC HPC voted 5-0 to designate S. John’s last night, over objections of Diocese. Now goes to vote to Planning Board and the City Council.